Over the past five years, The Gin Club have established themselves as one of Australia’s most exciting bands, both through their studio albums as well as their inimitable live performances. Continually evolving from the traditional folk/country of their self-titled debut, The Gin Club’s seven person songwriting roster has developed a unique and distinctive style. Whilst they defy easy categorisation, their music contains elements of acoustic folk, wide screen rock’n’roll, psychedelia, country, pop and more – all delivered with a distinctly antipodean flavour. They have been compared to artists such as The Triffids, The Go Betweens and The Band. From a ‘collective’ of around eleven people, The Gin Club live band now features seven permanent members – Adrian Stoyles, Ben Salter, Conor Macdonald, Scott Regan, Bridget Lewis, Dan Mansfield and Gus Agars. Their live performances have become legendary, with all seven members singing lead, swapping instruments and harmonies, and performing everything from intimate acoustic ballads to wall-of-sound onslaughts. 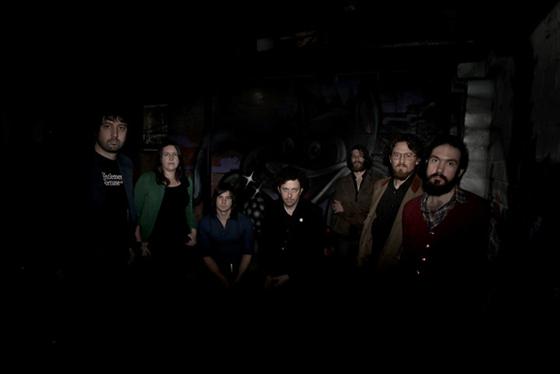 The Club have toured or performed with acts as diverse as The Drones, Band of Horses, You Am I, Paul Kelly, Liam Finn and Midlake, as well as performing at Splendour in the Grass, Big Day Out, Bluesfest, Sounds of Spring, Sunset Sounds, Musexpo LA and Canadian Music Week. Need your live music fix? Search for BAND OF FREQUENCIES here. Search for THE MIDDLE EAST here. Search for DAN SULTAN here.